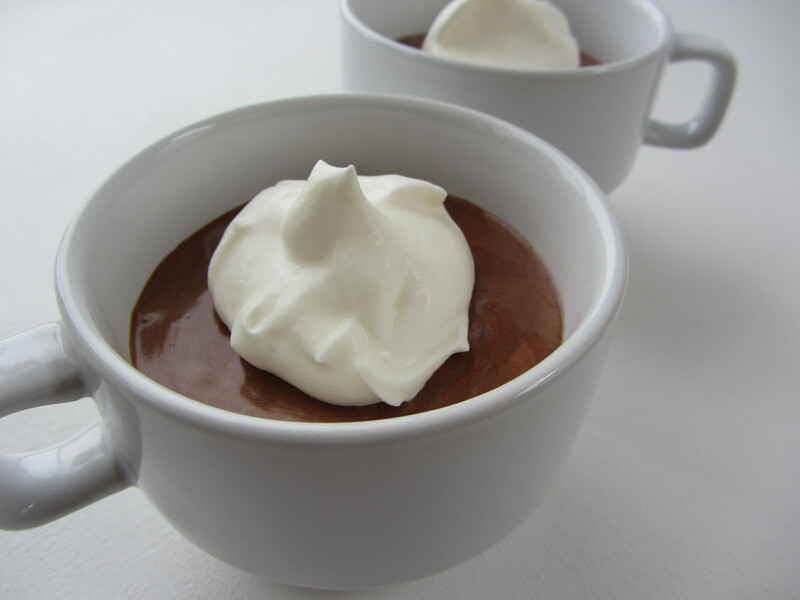 A while back I shared a recipe for making chocolate mousse. It was made using raw egg whites, which gave the mousse its light and airy structure. But for some, the idea of having raw eggs can be less than savory, especially if you are not confident about/or don’t know their source. Also, consumption of raw eggs is not recommended for children or expectant mothers. (Salmonella scares, while rare, are still real!) So here is a cooked version of the wonderful delight, starting with a custard base and then finished with cream, which is actually the more traditional way to prepare this chocolate dessert. No raw eggs = fun for all. The additional shot of espresso and the whimsy of being served in a little coffee mug is all bonus. Yay! 1. In a large bowl, beat the heavy cream and 1 tablespoon sugar until medium-firm peaks form. Reserve 1/4 cup of the whipped cream for serving. 2. In a medium bowl set over a double boiler, whisk the egg yolks and 2 tablespoons sugar until the mixture is light, fluffy, and nearly doubled in volume. Melt the chocolate in a microwave, then stir into the egg yolk mixture, along with the (optional) espresso, until smoothly incorporated. Remove from heat. 3. Stir in a quarter of the whipped cream into the chocolate mixture until smooth. If the chocolate begins to seize up, add in a little more cream to loosen it. Gently fold in the rest of the whipped cream, a third at a time, until just combined. 4. Divide mixture into four small coffee cups. Refrigerate at least 3 hours until ready to serve. Serve topped with a dollop of the reserved whipped cream. * If you don’t have espresso on hand, you can use black coffee. Or even a shot of coffee liqueur.